what is on the wall behind the bed? I'm thinking that k24krt was asking about the textured looking material lining the wall behind the headboard. Is it wallpaper? Yes, I was asking about the texture behind the bed. Thanks for letting me know. It looks great! Love the lamps next to the bed. Who makes them.? What is the material used on the wall? Thanks. Great nightstand. Do you know the name/company or where it can be purchased? Ditto - source of nightstand, please. Bookshelves - custom or stock? - how did you build those bookshelves? they look like they are flush with the wall? These are custom - thanks for the question! What I want so badly books in every room. Love the chair.....where is it from? You'll see in the image there is a green tag that specifies the source. It's the womb chair designed by Saarinen for Knoll. Great space. Can you please provide a source for the bed? Thanks. Thanks for your question. This bed was custom designed for our client. Please let us know if you have any other questions. Beige but not boring. All the different shades of beige here are the perfect backdrop for the multicolored wall of books and the various pops of bright color. Love it. What luxury — a bed surrounded by a vast collection of volumes. Putting away a good read when you're finished with it is as simple as reaching up to tuck it back into place.Tip: If you're lucky enough to have a bookshelf near your bed, switch the placement of books as needed so that the one you're reading is always close at hand. Headlining the room. If reading by osmosis has merits (we hope it does), then above-bed bookcases are a compelling option for the effortless assimilation of intelligence.Be a woodsmith: For bookcases you plan to paint, consider using poplar wood. It’s light and affordable; you can drill and nail it easily (then fill the holes with wood filler, which eliminates the need to use a finish nail gun); and it takes paint nicely. 6. Headboard highlight. 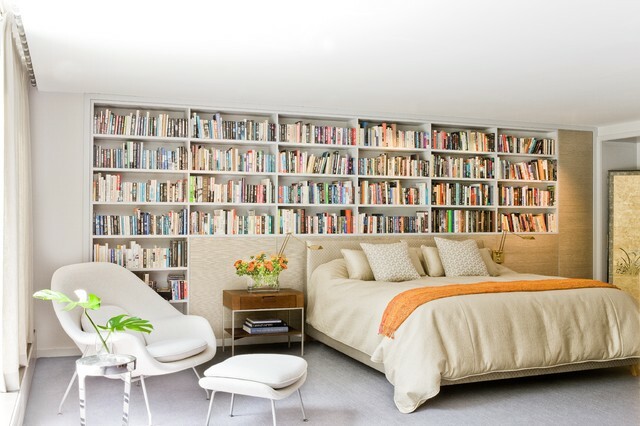 Who needs a grandiose headboard when you’ve got books galore? Placing the bed under a wall of custom bookcases is the perfect setup for those who like to read in bed. Both the books and reading lamps are easily accessible for an easy transition from wakefulness to sleep. Books all over wall...sound deadening too? Shows that you can have a plain-beige bed without the room being boring.